The warmest of all our insulated clothing, this substantial jacket is ideal for activities that involve little or no movement. 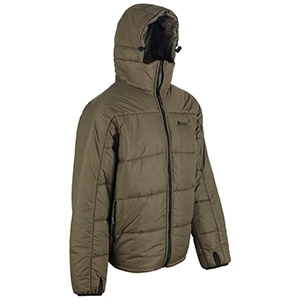 The Sasquatch is insulated with Snugpak's Softie® Premier filling to give great warmth and comfort, with a fine, soft, durable finish. The outer shell is made of Paratex Light fabric to make it windproof, lightweight and water-repellent. Ideal for activities that involve little or no movement, its insulated, permanent hood with volume adjuster ensures the snorkel follows your face without interfering with your vision. Comes with its own stuff sack. Please note: these jackets are oversized as they were originally designed to fit over Snugpak's Sleeka Jacket for extreme cold weather protection.